Stand Development of Film: Crazy, Brilliant or Both? Helicopter on a street corner in Wedding, Berlin. RPX 400 stand developed in Rodinal. Film Recipe: Rollei RPX 400 in Rodional 1+100 for 1 hour, agitate softly in the beginning and at the half hour mark. This recipe for black and white film development in the darkroom is one of many in a series. Readily available films and developers have changed over the last few years, and this is intended to be an up to date selection of recipes. Stand development is a crazy idea. And like most others, it has something to it, but isn’t going to be the cure-all it claims to be. The concept of stand development is to allow a developer to become completely exhausted, developing its unsuspecting film as much as possible. This goes against the grain (sorry, I had to) of “normal” film development, where the film developer has more than enough active chemistry in it. In normal film development, control of temperature and time are critical. In controlling temperature and time, you are controlling how much of the total possible reaction occurs (think back to Chem 101). In stand development, you just let the reaction play out. The beauty of stand development is that the same development time is used, no matter what. And that time, frankly, is arbitrary. The recipe for stand development is simple. Put your film in the tank, mix your Rodinal at 1:100, and go. The development tank needs a little agitation at the beginning to make sure it is evenly distributed, and be sure to bang out the air bubbles well. Let it sit for an hour. Then come back after dinner, and stop & fix as usual. Be sure to use a film development tank large enough to hold two 35mm films (or one 120 film): Rodinal needs at least 5ml in its working solution, which you won’t have with this thin dilution in a single-roll film development tank. Some people let it sit for as little as twenty minutes (gasp! ), while others have reported letting it cook in the fridge for three weeks. It doesn’t matter all that much. I went for a semi-stand development method here, where I gave the film development tank a shake at the half hour mark. Some people feel strongly about doing or not doing this. In my case, I am nervous about an air bubble wrecking a shot and decided to cut my losses. My thought is that there won’t be much practical difference between a half hour and a full hour development time, but a bubble would rain on my parade. The clear benefit to stand development is ease. If your light meter is busted and you aren’t great at estimating the correct exposure, stand development is there to rescue you. Rodinal 1:100, 1 hour. Or you pulled some weird roll of film out of that camera your aunt gave you which hasn’t even been made since you were born? Rodinal 1:100, 1 hour. Or you shot your beloved Tri-X and need to develop it but you ran out of D-76 and your communications are down? Rodinal 1:100, 1 hour. The shot here came from a camera that someone gave me, and I didn’t know if it worked at all. Does. Of course, I didn’t learn how accurate the shutter is by doing this. One of the really cool things about stand development is that you can change your ISO mid-roll and not worry about push or pull development. So you shot that same roll of Tri-X at 200 when it was sunny, 400 when it was cloudy and 800 at the party that evening? Rodinal 1:100, 1 hour. There are downsides to stand development. Plenty of ’em. Stand development is a one-size-fits-none procedure. Although it will always work, it will never give you the best possible result. Rodinal is excellent for tonal rendition (dynamic range) but on the grainy side, and stand development takes that to the extreme. It develops over a huge tonal range, hence working regardless of the film or exposure. And it pulls the grain out, strong. That helicopter shot should be perfectly exposed in broad daylight (that looks like 1/500s to me). 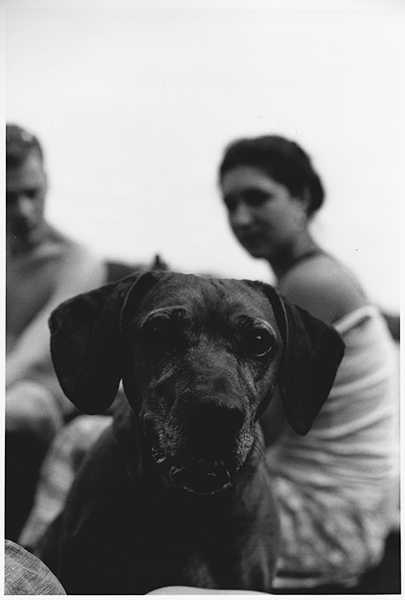 The scan is from a silver gelatin print, enlarged to18x24cm (7×9″). There should hardly be any grain there. But there is a ton. In this case, I like the effect quite a bit. It matches the lens quality on my dear Yashica 35 Electro. 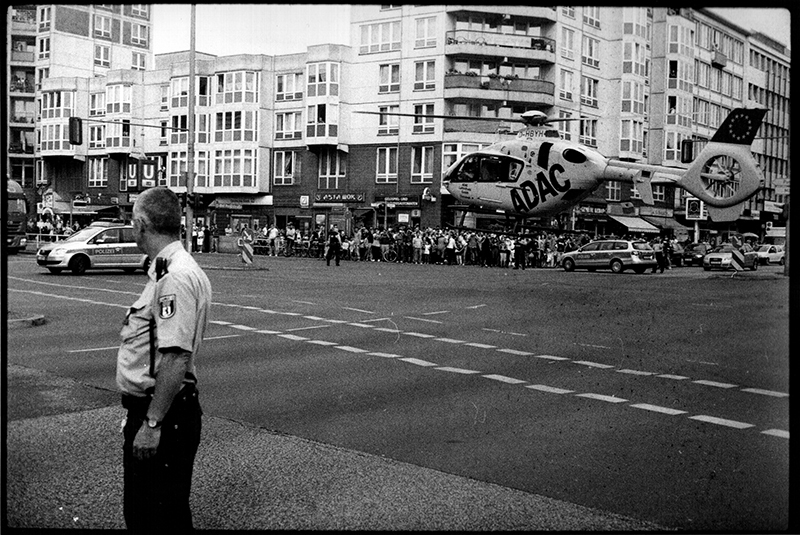 And the absurdity of a helicopter in the middle of a busy intersection in Berlin. Interested in learning more? Check out the courses and workshops offered here. This entry was posted in black and white, Film Recipes and tagged ADAC, rodinal, Rollei RPX, stand development, Yashica 35 Electro on August 3, 2013 by Analog Photography Berlin. Fuji Acros 100 in Rodinal 1+50 at 20C for 11 minutes. Film Recipe: Fuji Acros 100 in Rodinal 1+50 at 20C for 11 minutes, constant gentle agitation for first minute, 2-3 gentle inversions every minute after that. Fuji Acros is a fine grain black and white film with very subtle grays. Rodinal is a very stable film developer, inexpensive and comes in liquid form – it is an old guard film developer, generally producing an extraordinary tonal range but often a sharp and grainy result. The combination of Acros with Rodinal gives a broad and extremely smooth tonal range, but relatively large grain – considering how smooth the film can be. The film is rated at ISO 100, but some shadows are lost here if the sun is shining bright, as in the picture of Teka at a festival. Consider overexposing by 1/3 – 1 stop in blazing sunshine. 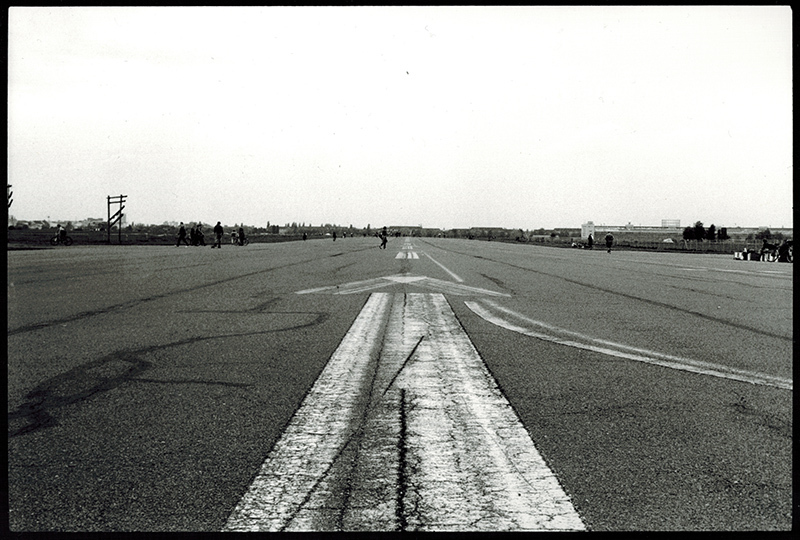 The image is a scan of a black and white print on Fomaspeed Glossy RC paper, developed in Adonal. This entry was posted in black and white, Film Recipes and tagged acros, darkroom, develop film, rodinal on July 22, 2013 by Analog Photography Berlin. Film Recipe: Ilford HP5+ 400 in ID-11 1+11 at 20C for 11 minutes, constant agitation. This is my go-to film and developer combination, as it is for many film photographers, with good reason. One of the advantages of film photography over digital is the extraordinary tonal range which film can record. And Ilford’s HP5 is one of the best at doing exactly that. The result is a relatively low contrast negative, but you can always increase the contrast later when printing. Getting information onto the negative is a crucial step in black and white analog photography, and this combination of developer and film will effortlessly do exactly that. The downside of HP5 with ID-11 is grain. This isn’t a fine-grained combination, and it is too much for some people. That makes this combination a better choice as a medium format black-and-white film than as a 35mm film. I use it for both, knowing that the final photograph will have a different feel. This entry was posted in black and white, Film Recipes and tagged black and white, develop film, HP5, ID-11 on July 14, 2013 by Analog Photography Berlin.